Arnel's Gluten Free Bread Mix came to my attention when I visited a farmers market away from home. As you can tell from my blog, I'm not on a gluten-free diet myself. But some of my friends are, and so I occasionally convert one of my recipes to gluten-free for them. 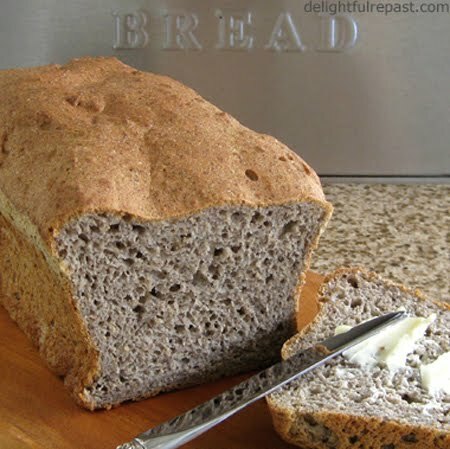 I've succeeded with scones, biscuits, pancakes, waffles, cookies and cakes; but I had never tried a loaf of gluten-free bread though I make all kinds of wheat bread. When I reached Arnel's booth and saw that she had a bread mix in her product line, I had to stop. She had samples, and it was the best looking gluten-free bread I've ever seen, and it tasted as good as it looked. Now, I've never been one to use a mix of any kind. Not that there's anything wrong with that; I just happen to enjoy the process as much as the result. The mix (no "ordinary" mix) has nine wholesome ingredients, 47 percent of which are organic. So I decided to give it a try. I followed the directions on the package exactly. There is no need for a heavy-duty stand mixer; the dough is not too heavy for a regular mixer. The rise time was considerably longer than that indicated on the package; took 55 minutes in my average-room-temperature kitchen. My oven temperature is quite accurate, so I followed package directions to bake at 350 degrees for 30 minutes. When I removed the bread from the pan and tested for that hollow sound and stuck a wooden skewer in the side, it tested done. But it soon showed signs of caving at the sides just a bit, not enough to be a problem; but next time I will definitely either bake it 5 or 10 minutes longer or use just one cup of water instead of 1 1/8 cups. I set the loaf on its side on the cooling rack, as recommended by Arnel, then switched it to its other side after about 5 minutes. Any bread should be cooled at least an hour before slicing, so I forced myself to wait a full hour. The loaf sliced beautifully. Where some gluten-free breads are hard, dense, crumbly and dry, this loaf made perfect slices of soft bread you could make a sandwich with in the morning that would be perfectly delicious several hours later. "The fact that this bread behaves like a piece of wheat bread," says Arnel, "is what makes it extraordinary." I deliberately ate less of it than I would have liked so I could see how long it would stay fresh. After four days, it was still fine! If the color of the bread in the photo looks a little strange, don't blame it on my photography--well, not entirely! That's the buckwheat. The loaf looks very golden brown on the outside, but the inside of the loaf has a slight, sort of bluish cast. Buckwheat also has a very distinctive flavor that might take a bit of getting used to for those who don't already love it. If you haven't tried it, I hope you will. It's a unique flavor that tastes a bit flowery to me (don't ask me what that means--it's just one of my vague feelings). Arnel's Originals, which will celebrate its first anniversary next month, also makes a gluten-free pie crust mix (71 percent organic ingredients) and gluten-free pancake mix (80 percent organic ingredients). I look forward to trying them. The three mixes can be purchased at 16 retail locations or ordered online at arnelsoriginals.com. Thanks for stopping by, Sully! As to the photos, well, I do my best with my limited knowledge AND limited camera! Thank you, Peter. I'm still experimenting with light in the kitchen. Need a bit more time to implement the ideas. Hey Jean. Thanks for introducing yourself at my blog. You said cooking was your hobby so I had to check out your site and I am so glad I did, except now I am HUNGRY :) . Personally, I'm not the best cook but I'm learning finally, and I guess that's better than nothing. I think it's a skill that never will become useless and always can be perfected so that's really cool you are living out your passion. The bread looks wonderful to me! And it's so easy, Jenn! Thanks, Reggie. Food is definitely one of life's simple pleasures! I'm glad you're learning to cook. You will find that I write all my recipes out with very detailed instructions, making them much easier for those who are learning. Jean, I just now read your response to my comment on "food blog s'cool" back in April. Thanks for your kind words. I still haven't monetized my blog, and I see you don't either. I may start sometime, but still not sure. I think your photos are beautiful, and I appreciate your jam recipes-just today I made raspberry jam-which flopped and did not jell-I will try a couple of your recipes-maybe the peach-and let you know how they work for me. Good luck with your forway into gluten-free. Thank you, Mickey. Definitely try the peach jam. It's the one I developed my own method for to make it set more than the typical freezer jam. I love the consistency of it. I'm using the batch I made "their" way as a sauce for ice cream. Your raspberry jam that "flopped" would also make a good sauce. Jean, this looks like a great bread mix! I wonder if it can be made without eggs. I may have to try that! Hi, Colette. Thanks for stopping by! I wouldn't be surprised if it turned out just as well with about 1/2 cup of flaxseed egg substitute. Can't remember now just how to make that, but you might know.